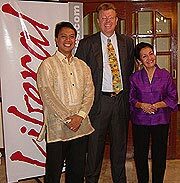 “Dialogue should be the hallmark of a policy for Mindanao.“ This was the core-message of Dr. Nereus Acosta, Representative of the First District of Bukidnon, in an address to the Friedrich-Naumann-Foundation Alumni Group at an informative meeting on May 15th, 2003. Against the backdrop of mounting violence in Southern Philippines, the Vice President for Mindanao of the Liberal Party said that “there is no substitute for peaceful negotiations”. A crowd of nearly one hundred participants hailing from what may be termed the wider liberal family listened attentively as the Liberal congressman presented his “roadmap for Mindanao”. According to Dr. Acosta, “democracy in its fullest decentralized and devolved forms must be allowed to evolve and take root in Mindanao”. Furthermore a functional federal system should be considered.